My second panel was scheduled for Monday morning. I got to share the stage with two other authors: Emily St John Mandel and Charlotte Wood. We had not read each other’s works, but our chair Cath Kenneally had, and she wove it all together under the theme ‘All Stories are Love Stories’. We all used the term ‘love story’ broadly, and spent as much time talking about friends and family as we did about romantic relationships. I was the only speculative fiction writer, but Emily’s work sounds like an interesting crossover, literary but with a touch of noir that at times gets her categorised as a genre writer as well. And speaking of reading other people’s works – so many books, so many cool authors, so little time! I began to feel a bit less smug about my minimalist luggage arrangements. There were books available to buy, authors present to sign them, and I had no space. Eventually, I made arrangements with Sean Williams to ship some books home (thank you Sean!) and happily went on a splurge. I missed Justine’s second panel, but we both caught Scott’s reading, an excerpt about an alternate WWI which confirmed my desire to acquaint myself with the world of Leviathan. Then a group of us went off to have more good food (Japanese this time) and fun. 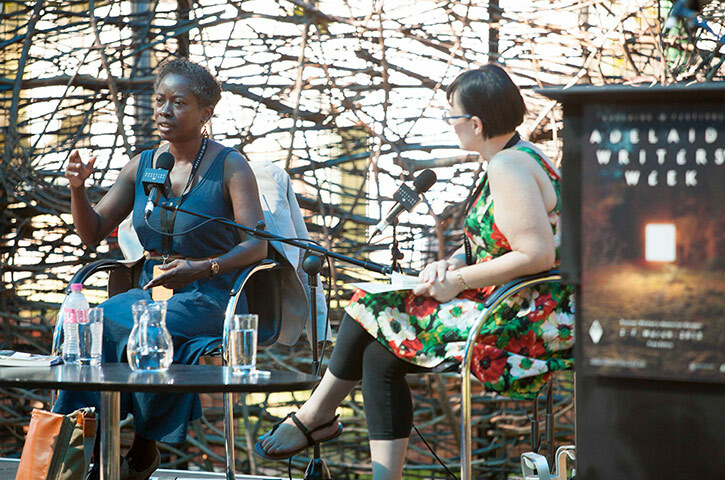 That was my final day of Adelaide Writers’ Week events. On Tuesday morning, I had a half-hour live interview with Richard Fidler, the last of the interviews set up by Tracey. I have to say, I was very impressed with the preparations for this interview. The pre-interview for this took place the previous Friday so that there was already a sense of what themes and topics would be interesting and relevant. We also had a brief chat before the actual interview and he put me completely at ease. And that was Adelaide! I must say how grateful I am to the Writers’ Week staff for their excellent organisation and care. Laura Kroetsch, the Director, and Anna Hughes, the Coordinator, were present and accessible and amazing. Pan Macmillan publicist Tracey Cheetham and the Adelaide Festival National Publicist Prue Bassett were tireless, efficient and charming. There were many others, from staff to volunteers to friends, who were just lovely and made sure I had a great time in Adelaide. I hesitate to list names because I know I will forget someone, but some have been mentioned in previous posts. My next grand journey will happen in summer, but that deserves a post of its own! Good music, good food, good company, a black swan and some black ants, and other etceteras. On Saturday, I again breakfasted with Justine and Scott, and had some laugh-out-loud moments because they’ve both got great comic timing. I was starting to feel better. Jet lag, especially jet lag after three flights, is no joke. It’s a fatigue so deep it feels like the marrow is draining out of your bones. Fortunately, Saturday was a relatively light day with two purely enjoyable items. The first was a coffee meeting with Dr Amy Matthews, who was to moderate my Sunday panel on Redemption in Indigo. She suggested we meet in advance and chat a bit about what to discuss. We ended up sitting on the grass down by the river in marvellous conversation for about three hours. There was a brief encounter with an oddly friendly, yet shy, black swan who approached us but when we merely stared warily and declined to offer it food, it sidled away with its head tucked into its back as if it was napping, or maybe just embarrassed. Swans are sizable birds. I do not mess with swans. Nor geese. The Writers’ Week reception took place that evening. A group of us gathered in the hotel lobby to walk over to the venue. A cheerful, charming gentleman introduced himself to me as Tom Keneally. I was still insufficiently alert, so it was much later when I clued in to who he was and got him to sign my just-purchased copy of The Chant of Jimmy Blacksmith. The reception was most enjoyable in a way that can only be managed when a room full of writers and other literary types get together and have conversations. Several of us got hauled aside by the Guardian (UK) for some photos. After the reception, because the night was still young, I followed Tracey (the publicist) and a few others to the Barrio where there was a live band playing some excellent music. Eventually it dawned on me … wait a minute! That’s Soul II Soul! Pure nostalgia, great music – which alas, I could not fully enjoy because before they finished playing their set I realised that there was not much keeping me upright but sheer willpower. I chose to be sensible and went to bed. There are things I can’t quite recall. For example, there was a stunning fireworks display down by the river which we (Justine, Scott and I) witnessed up close (very close!) from the terrace at the back of the hotel. Was that Friday night or Sunday night? I can’t remember! And I forgot that I did in fact go out to dinner Friday after the opening night performance with Sean Williams and his wife, Scott and Justine, and Isobelle Carmody (one of those delightful people who only have to speak twice to make you want to rush out and buy their books). One of the reasons it became so hard to keep track of the days was that I was taking (whenever I could) a long nap during the day and having a short sleep at night. There’s a 14.5 hour difference between Barbados and Adelaide, almost a direct day-to-night flip. On Sunday, I went down to the Writers’ Week venue in the morning well in advance of my afternoon panel so I could do a radio interview on-site. It was Kids’ Day, and there were little ones running about in costume. It was a great family atmosphere, everything outdoors and the weather hot, dry and clear. And ants. I was sitting under the trees listening to a panel when I looked to my right and saw that the gentleman sitting next to me was covered in black ants. They were crawling up the plastic chairs from a broad trail on a nearby tree. I alerted him and helped brush him off; he changed chairs and moved away from the tree. I was twitchily viewing my own chair for ants for a while and just when I managed to calm my paranoia I looked to the row ahead and there was a woman crawling with ants. The panel before mine featured Justine Larbalestier, and Isobelle Carmody. It was enjoyable and relaxing (no, I did not nod off) and put all thought of black ants out of my mind. Most if not all of the panels were being recorded for television, which meant that later during my panel when I actually was stung by an ant, I had to make it look very casual, as if I was merely brushing my shoulder rather than slapping the life out of the little miscreant. Sean Williams fortified me with a chocolate freckle before my panel, and rewarded me with a dark chocolate covered macadamia afterwards. Walking around with chocolate treats is apparently his ‘thing’. I’m not complaining. The panel went really well, thanks in no small part to our preparation the previous day. I got an absolutely brilliant question, weighty with knowledge and perception, from a woman in the audience who, when I queried her, admitted to having been in Barbados just the year before. I’m happy the panel was televised, but especially for that question which gave me a new insight into the approach I chose for Paama’s brand of heroism. After the panel, I had a fun time at the signing table, then went back to catch the second half of Sean interviewing Scott about Leviathan. That was fascinating, and I wish I could have heard the entire session, but it was enough to tempt me to buy the book (and Behemoth and Goliath). Well played, Mr Westerfeld. Before I forget, I should mention that I also found out from Amy that Redemption in Indigo is on the reading list of an undergrad course at the University of Adelaide, so there were students at my panel and in my signing line – yay! That’s what I can remember of the weekend! Strictly speaking, that was Day One and Day Two of the Writers’ Week but Days Two and Three of the Adelaide Festival … but nevermind. I’m numbering these Days according to the time I was spending there, not by their calendar. Day One began well. A text from Justine Larbalestier led to breakfast with her and her husband Scott Westerfeld. I had not met Justine before, but we’d bonded over cricket on Twitter. I’d heard Scott do a reading at the KGB Readings in New York, back in 2010 when I was there for the Brooklyn Book Festival. As well-travelled souls with lots of experience crossing both the date line and the equator, they were very kind to me in my still semi-woozy state. The day got very busy after that. The excellent Tracey Cheetham, publicist at Pan Macmillan Australia, is also responsible for publicity for Quercus titles, and she tirelessly set up several interviews for me during my time in Adelaide. On Friday morning I had two important phonecalls: one an interview for a podcast, the other a pre-interview for a live radio interview taking place the following week. Then I went to the ABC studios in the early afternoon to discuss Redemption in Indigo with Sonya Feldhoff for the ABC 891 Book Club. I tried to alleviate the jetlag with naps, but it was still an effort to get up and go to the reception and performance for the opening night of the Adelaide Festival. The dance performance was very much appreciated by the audience, but I’ll admit I lost my fight to stay awake and discreetly nodded off, relatively upright in my comfortable seat, until roused by applause. Next, Day Two, in which there is much improvement to my level of mental alertness.